Vogt, P. (2000) Lexicon Grounding on Mobile Robots PhD thesis Vrije Universiteit Brussel. De Wit, J., Schodde, T., Willemsen, B., Bergmann, K., de Haas, M., Kopp, S., Krahmer, E.J., & Vogt, P. (2018). 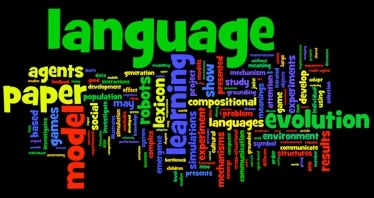 The Effect of a Robot’s Gestures and Adaptive Tutoring on Children’s Acquisition of Second Language Vocabularies. In Proceedings of the 13th Annual ACM International Conference on Human-Robot Interaction (HRI’18) Link. Tony Belpaeme, James Kennedy, Paul Baxter, Paul Vogt, Emiel J. Krahmer, Stefan Kopp, Kirsten Bergmann, Paul Leseman, Aylin C. Küntay, Tilbe Göksun, Amit K. Pandey, Rodolphe Gelin, Petra Koudelkova, and Tommy Deblieck (2015) L2TOR – Second Language Tutoring using Social Robots. In Proceedings of 1st Int. Workshop on Educational Robots. Springer. Aussems, S. & Vogt, P. (2015) Adults tract multiple hypotheses simultaneously during word learning. In Proceedings of CogSci 2015. Vogt, P. & Mastin, J.D. (2015) Cultural differences in infants’ non-verbal communication and vocabulary development. Talk presented at the Child Language Symposium 2015. Mastin, J.D., Vogt, P., & Schots, D. (2015) Exploring who’s doing what? Infant engagement and vocabulary development in Mozambique. Talk presented at SRCD 2015. Vogt, P. & Mastin, J. D. (2014) Social word learning strategies in different cultures. In Proceedings of Evolang X.
Vogt, P. & Mastin, J. D. (2013) Rural and urban differences in language socialization and early vocabulary development in Mozambique. In Proceedings of CogSci 2013. Abstract. Matusevych, Y., Alishahi, A. & Vogt, P. (2013) Automatic generation of naturalistic child-adult interaction data. In Proceedings of CogSci 2013. Abstract. Vogt, P.,, Masson-Carro, I. & Mastin, J. D. (2013) Predicting vocabulary development from co-speech gestures: Duration or occurrence, that’s the question. In Proceedings of TiGeR 2013. Abstract. Vogt, P. & Mastin, J. D. (2011) The effect of using multimodal gesture on infants’ vocabulary development in natural environments. Presented at the 12th International Congress for the Study of Child Language, Montreal. Mastin, J. D. & Vogt, P. (2011) Joint Engagement and Vocabulary Development: Re-defining data collection, categorization and analysis. Presented at the 12th International Congress for the Study of Child Language, Montreal. Vogt, P. (2009) CASA MILA: Cross-cultural and social aspects of multimodal interactions in language acquisition In L. Cañamero, P.-Y. Oudeyer and C. Balkenius (Eds.) Proceedings of the Ninth International Conference on Epigenetic Robotics Lund University Cognitive Studies, 146, pp. 247-248. Haasdijk, E., Vogt, P. and Eiben, A.E. (2008) Social learning in population-based adaptive systems In Proceedings of IEEE Congress on Evolutionary Computing IEEE Press. Abstract. Smith, A. D. M. and Vogt, P.(2004) Lexicon acquisition in an uncertain world. In Proceedings of 5th Evolution of language conference. Vogt, P.(2004) Generalisation as a bias toward the emergence of Zipf’s law. In Proceedings of 5th Evolution of language conference. Vogt, P.(2004) How ecological regularities can shape linguistic structures. In Proceedings of 5th Evolution of language conference. De Boer, B. and P. Vogt (1999). Emergence of speech sounds in changing populations. In D. Floreano, J.Â­D. Nicoud, and F. Mondada (Eds. ), Advances in Artificial Life: Proceedings of 5th European Conference ECAL’99. Springer. Steels, L. and P. Vogt (1997) Ancrage de Jeux de Langage Adaptatifs dans des Agents Robotiques. In Ali Cherif, A. and Signorini, J., editor, Intelligence Artificielle et Complexité, Paris, 1997.